Posted on October 31, 2016 at 5:26 am. Gym stagnation has been discussed a lot lately and it is a real problem for Pokémon Go. This is not one of those complain or suggestion articles like you would probably have seen everywhere. We have also received questions on how to fight level 10 gyms. 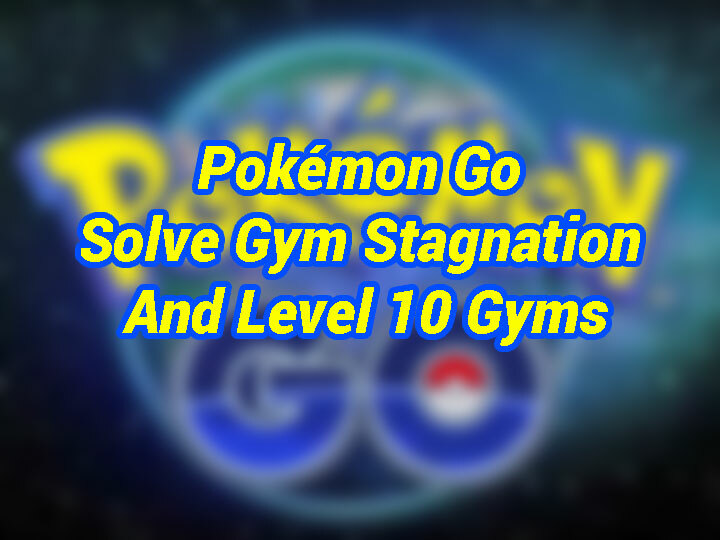 So instead of the usual ideas that got around on how Niantic should solve the gym stagnation problem, we will take a different approach this time, and instead teach you how to solve gym stagnation. In order to build a level 10 gym, 10 trainers from the same team is needed. You can wait for random strangers to add in their Pokémon if there are empty slots or even train it up slowly themselves. It does require a little bit more coordination. A dedicated trainer can tear down a level 10 gym alone, but it will take more time and resources doing it alone. On the other hand, trainer can also team up with other team like Instinct and Valor team up to destroy Mystic gyms. The same can’t be done for building a gym. Training is harder and needs more strategy than attacking a gym as trainers would need attacker of much lower CP in order to gain more prestige. Even though training can potentially increase prestige of up to 1000 per battle, but sweeping a gym which is rather easy for any gym that is below level 7 gives the attacker a bonus of 1500 prestige. This negates the prestige bonus for both sides. When there are dedicated attacker(s) around, there is rarely any case where the trainer would be able to defend the gym. Some may argue that gyms that are built with the “Bubblestrat” is much easier to build than taking down. While it is true that attacking a gym that is being Bubblestrat is pointless, the team will still need 10 trainers to fill up the slots for a proper level 10 gym. A trainer can take it down solo. Why Do You Want To Tear Down Level 10 Gym? Level 10 gyms are not easy to tear down. So why do you want or need to do it? Let us not forget about the advantages. This is the only way that we can battle gym stagnation. Winning the psychological warfare. Do this long enough, and the defenders will just give up as they will realize it is not worth it to defend gyms. Tearing down a level 10 gym will give a lot of experience. It will be a good source of XP if done with team mates. Gym defender bonus of 10 coins and 500 stardust per gym. Many overlooked this and think it’s not worthy the effort but if everyone just sits back and didn’t do anything about gym stagnation, the problem won’t solve itself. Tearing down a level 10 gym is not easy and it should not be. Level 10 gyms are build by 10 trainers. So do not expect to be able to tear it down alone within a couple of minutes. It will be easier done teaming up with other trainers. Trainers will still be able to tear down a level 10 gym alone but it is more resource and time consuming. Resource – You will need a good amount of potions and revives. The amount of resources needed are mostly dependant on your attacking squad. Attack more gyms and you will have a rough idea of how many is needed to tear down a level 10 gym. Generally, you will need at least 25 hyper or max potions, 25 super potions, 25 potions, and 10 revives to tear down a level 10 gym with a squad of 2000+ CP Pokémon. Time – Attacking a level 10 gym alone is very time consuming. It could easily take an hour to completely bring one down. Good attacking squad – You need to know type advantage and have a squad of high CP Pokémon that is effective against the common gym defenders. This will need a little more planning and understanding of the combat mechanics, and we will elaborate more below. If you have an effective team against the defenders, you will spend less time and resources taking a gym down. Dodging – Dodge is very important. Some quick attacks like Lick from Snorlax which doesn’t deal much damage could be ignored, but try your best to dodge every special attack. This is important so that you will be able to sweep the gym and gain 1500 bonus prestige. In Pokémon Go, the above quote will translate to knowing the type effectiveness and have a good squad against the common gym defenders. Let us look at some of the strong gym defenders and what is good against it. Dragonite – Dragonite has a very high CP and that is why it is common to see Dragonites at the top of a gym. Lapras is the best counter for Dragonite as Ice type attacks are super effective on Dragon and Flying type. If you do not have a Lapras, other Ice type Pokémon like Cloyster and Dewgong is equally effective but will need a little bit of dodging due to their lower HP. Wigglytuff with Pound and Play Rough is very good against a Dragonite as well. Snorlax – There is no real counter for Snorlax as the Fighting type which should be super effective on Snorlax is too weak to go against Snorlax. Rhydon can reduce Snorlax’s Normal type special attacks and at the same time, Rhydon’s Rock Smash fast attack is super effective on Snorlax. Vaporeon which is easily obtainable will be equally good against Snorlax because its quick attack, Water Gun has high DPS and fast enough that it is easy to dodge. Lapras – Both Snorlax and Lapras has high HP and does not have real counters. Your best bet is to use Fire type Pokémon like Arcanine or Flareon which will reduce the damage dealt by Lapras. Exeggutor – Exeggutor is weak against Fire and Bug type Pokémon. Arcanine or any Bug type Pokémon like Parasect will kill Exeggutor easily. Try to dodge all of its attack though as Psychic type attacks are painful. Vaporeon – Vaporeon which is a Water type Pokémon is weak against Grass type Pokémon like Venusaur. Even though Electric is super effective against Vaporeon, but Electric types are rather weak at the current meta. Arcanine – Arcanine is seen quite often in gyms due to its high CP. But Fire type Pokémon are not good defenders so a Vaporeon will easily counter an Arcanine. You do not need to have a perfect squad in order to take down a level 10 gym. The most important is knowing the defenders’ weaknesses and use a squad that is effective against it. If you are good in dodging, a Pokémon’s fast attack is very important. Those special attacks with one charge bar will usually let you get hit for more damage if not timed properly. It is better to use a one bar special attack right after the defender has used a special attack. Most of the time, you will be able to get through with just using the fast attack if you can dodge properly.